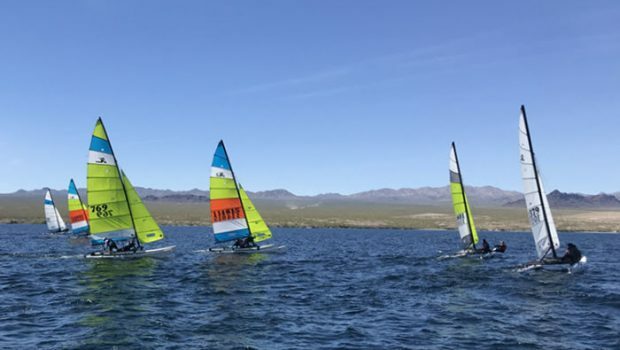 The 2019 Hobie Midwinters West regatta was held April 6-7 in Lake Mohave, Nevada. Nineteen teams made the trek to 6-mile cove – down a dirt road that dead-ends at a not-so-secret mecca for kiteboarders and sailors alike. With high winds on the day before racing, most of the sailors opted to pass on practice and instead watched kiteboarders practice aerial tricks and fly along the choppy, dark water. Of course, day one of racing was a complete 180: glassy with no wind in sight. The second day looked slightly more promising with a light southerly breeze soon shifting to a building northerly breeze which allowed for three races before fading. In true Hobie-Way-of-Life style, the competitors, spectators, RC, and volunteers all camp together on the beach for the weekend. It’s hard to tell which aspect is more of a draw: the sailing, the competition, or the long-standing friendships! This regatta was also the Southwest Area Championship – a challenge between Hobie Divisions 2 & 3. It was won by Mike Montague & Kathy Ward (Hobie 16, Division 3); Denny & Susan Osburn (Hobie 18; Division 2); and Gordo Bagley (Hobie Wave, Division 2).